Are you brave enough? So, let us check it! 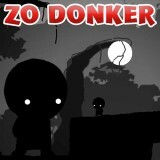 In this game you will collect all the gems and help this cute guy to pass all the troubles. Are you ready for such a challenging game? Then do not waste your time and do it! Be sure that you will like it.